Our 100% All Natural Organic Herbal Tea is your best liver cleanse detoxifier solution! With a blend of 100% all natural and USDA Certified Organic ingredients that helps gently cleanse toxins from your liver without significant side effects, our detox tea is aptly named Teatox Life. Our body unlike any other machine in the world, has spare parts that are irreplaceable. We ask you to respect your body, eat healthy, use a standard regime and couple it with our liver detox tea for best results. 100% Customer Satisfaction Guarantee - Try our amazing loose leaf herbal detox tea and if you are not completely happy, request a refund. WHAT THIS DETOX TEA IS NOT: This liver detox tea is NOT a magic pill for your liver. Liver is probably one of the most important organs in the body and needs to be taken care of. This means maintaining healthy eating habits and non-fatty fiber rich food. It is important to respect your body and give it the time it needs to cleanse, detox and process. Our detox cleansing tea works through your system and helps regulate your system with daily use. 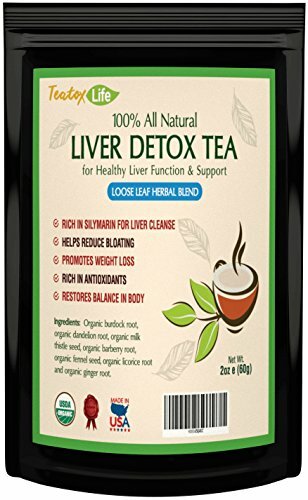 Our liver detox tea is great for long term use. If you have any questions about this product by Teatox Life, contact us by completing and submitting the form below. If you are looking for a specif part number, please include it with your message.